Quonset Huts are basically structures made of corrugated steel which are prefabricated and has a half cylindrical shape. These have been important structures that have worked as a reliable storage location for military, industrial giants and backyard hobbyists. Being made of steel, these are quite tough, economical and safe. The basic design of the structure is taken from the Nissen Hut, discovered by the British soldiers during World War I. Due to its peculiar shape, Quonset huts are sometimes also referred to as Arch Buildings. These buildings basically come ready-made, or for a better use of word, prefabricated. Its steel structure gives it the highest resistance possible from a pre-engineered building. Not only does it provide resistance against hurricanes and blizzards, but also it has a tough exterior and even the cost is cheap. During the Second World War, the US Military constructed and used many such huts in combat fields. 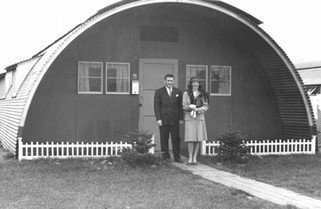 The very first constructors of the Quonset Huts were the George A. Fuller Company. The very first Quonset Huts took 60 days to be constructed. It had a 16ft x 36ft framework, constructed using steel having 8ft radius. Both the ends of the structure were covered using plywood and had windows and doors made in them. The side parts of the frame were covered using sheets made of corrugated steel. The interior consisted of wooden flooring and lining. The building was usually placed on concrete, ground with wooden floors or pilings. Though most of the Quonset Huts were constructed using steel, the US Military had constructed a few wooden huts but they were used rarely. In no time, these structures became extremely popular as they could be easily relocated and set with the help of enough people. Moreover, they had a variety of uses. One can use it as a storage area, as temporary living quarters, medical areas, workshops and much more. Before the construction of these huts, all these purposes had to be served by utilizing civilian buildings and in some cases, canvas tents. These huts were designed keeping the structure of the Nissen Quonset Huts in mind. The only difference was that the T-Rib has a different system and style of walls than the Nissen. These huts are a modified version of the initial Quonset Huts. They had modified the arch and included 4 ft vertical sidewalls. The George A. Fuller Company, located at West Davisville, constructed about 25000 such huts. This hut was designed and constructed by the James Manufacturing Company, located at Fort Atkinson. This new version had wooden ribs, specially made to withstand extremely cold weather. They were mainly used in the Arctic. One type of Quonset Hut is made of plywood and has a wooden frame. The Portaseal hut is basically the Canadian equivalent of such wooden huts. This is a very unique type of hut. Its outer side is made of Celotex, a special type of Masonite, which is waterproof. These huts can easily be recognized by the vent covers by Ridgeline. 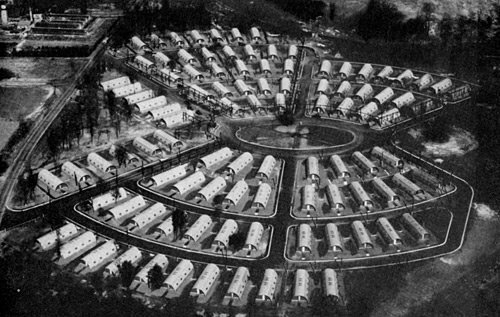 These huts were constructed by the Morrison-Knudsen Company. The main purpose of these huts was to store special and confidential military contracts about construction of remote sites. These huts were very popular during World War II. Constructed by the Armco International Corporation, they were designed and build as shelters. They served the purpose of bunkers made from corrugated ingot iron. These are arched Quonset Huts made totally of steel to withstand high winds. They were constructed and manufactured by the Butler Manufacturing Company located at Kansas City, Missouri. These huts were created by the Cowin and Company, Inc. mainly used by the Air Corps; these are large constructions that are semi-circular in shape. These served the purpose of warehouses made of bloated steel and are thus also sometimes called “Steeldromes”. These are the largest types of Quonset Huts built. By the end of the Second World War, around 11800 of these buildings were constructed and put up. The Multiple Utility buildings are just special types of Utility buildings. With these, one can add extensions to the building in all directions. In width, the buildings can be extended to 61ft 6in and lengthwise, around 100ft. That gives the building a huge and extensive area. These are all the types of Quonset Huts that are available. Before buying or looking for a hut, one needs to figure out their own needs. If the need is basically household storage of unused material, small huts are the best options. For farms and ranches, where livestock and other materials need to be stored, a bigger and stronger Quonset Huts is a better option. For smaller huts, one can easily get a self-help kit and build their own huts. There are a number of factors on which the price of Quonset Huts depends. Some of the main factors are size, material and labour charges. One needs to be very careful about the material used. They need to research the types of materials available and choose for themselves what the best one will be according to their purpose. Moreover, it is always not necessary to buy or construct a first-hand Quonset hut. If searched properly, one can find a number of people wanting to sell their huts. Moreover, as Quonset Huts are makeshift structures, relocation is not a major issue.